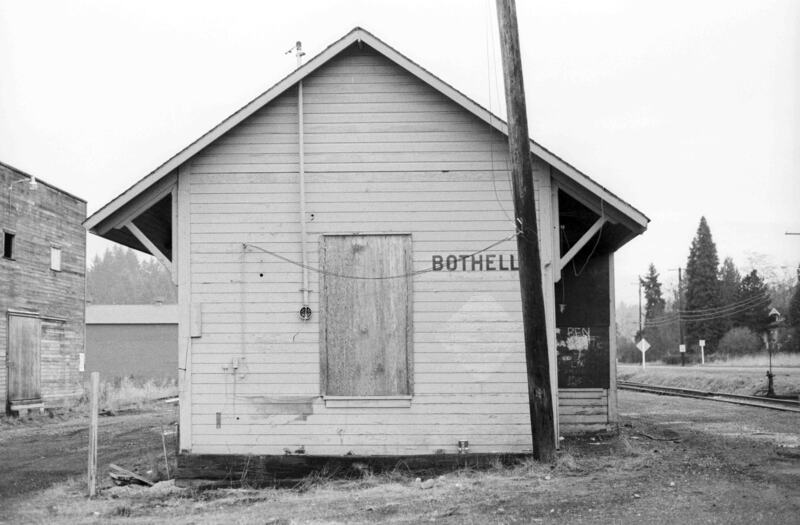 PROTOTYPE INFORMATION: Bothell a LDE? Bothell, Washington is a community adjacent to the Seattle metropolitan area. It is near the northern end of Lake Washington. 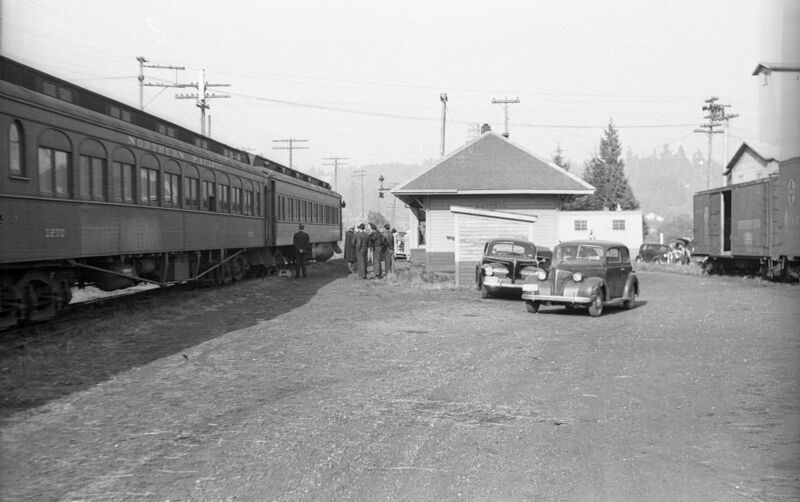 At one time, the Northern Pacific Sumas Branch ran through the village on its way to the Canadian border. There wasn’t a lot there even in its peak as source of traffic on the railroad. There were a couple regular shippers and small depot that housed the agent. The community to the west was Kenmore which had a log dump and a mill and to the east was Woodinville. There were several shippers in Woodinville but was also a junction with the line that ran on the east side of Lake Washington from Renton. Many of you may be familiar with the term “LDE” or Layout Design Element. Tony Koester has long championed the concept of adding prototype-based focal points to your railroad. The LDE brings together purpose, location, era and railroad. It can say something about the terrain, industry and intensity of operations. There are my attempt to pretend that I understand prototype operation. I don’t! I have always built stuff and hardly ever ran my equipment. Mostly because of my choice to live in the not so great state of California. Homes are at a premium as you likely already know. Readers of this blog know that I do have space now but have lacked the focus to put it into play. I am starting to see a way forward in direction. Bothell is my focus currently. It will make an interesting diorama and an operating point as part of my planned railroad. The layout of Bothell is very compact and simple. It has four switches and three customers. A moderately size feed mill, a sheet rock wholesaler and a team track with dock. The focal point is very compact depot of a non-standard design built by a predecessor of the Northern Pacific. To better illustrate the simplicity of Bothell, I have inserted a plan plot done by the railroad detailing some changes to the track in 1955. This is close to the era I model. I am in the process of sketching out the details of track placement on module for my garage. I need to fit a 60″ radius on one end and fit in the 21 feet allocated for the scene. Stay tuned on that front. The is a shot taken by Rick Leach showing the depot just prior to it being torn down. In fact, demolition was underway. The camera is point northwest. This not the era I intend to model but the large collection of photos Rick shared really help with planning. This is the west end of the depot. You can see a small portion of the feed mill in the background. This is the switch leading to the customers. Note the super elevation on the main and the spur pitching the opposite direction. This is one feature that will not make it on my scene. The lead photo was taken by Rick’s dad in 1963. 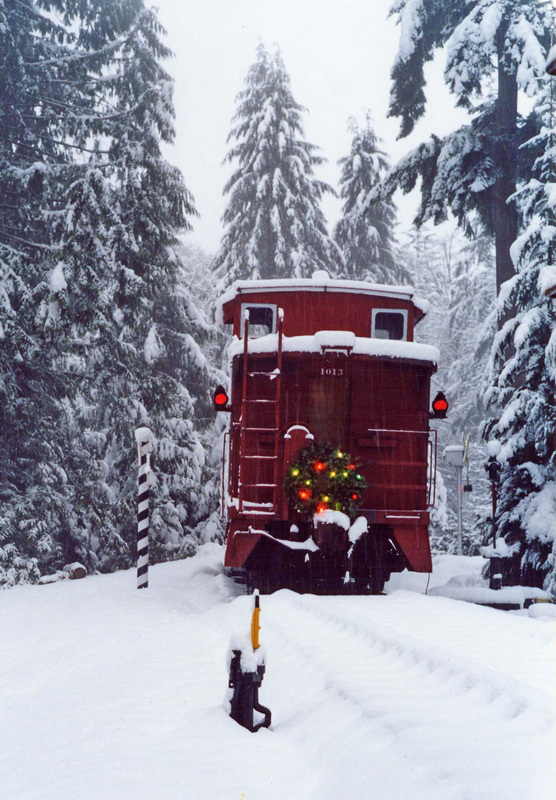 It captures much of the original characteristics of the old Northern Pacific. The classic GP-9 in its original colors of imitation gold and black long since gone from the northwestern rail scene. By the way, the depot had been rebuilt several time over its life. There are three different siding material used with shiplap on the west end and novelty on the east end. The hip roof had cedar shingles and a platform for a fire barrel. The NP adopted a sand and brown color scheme in 1943. 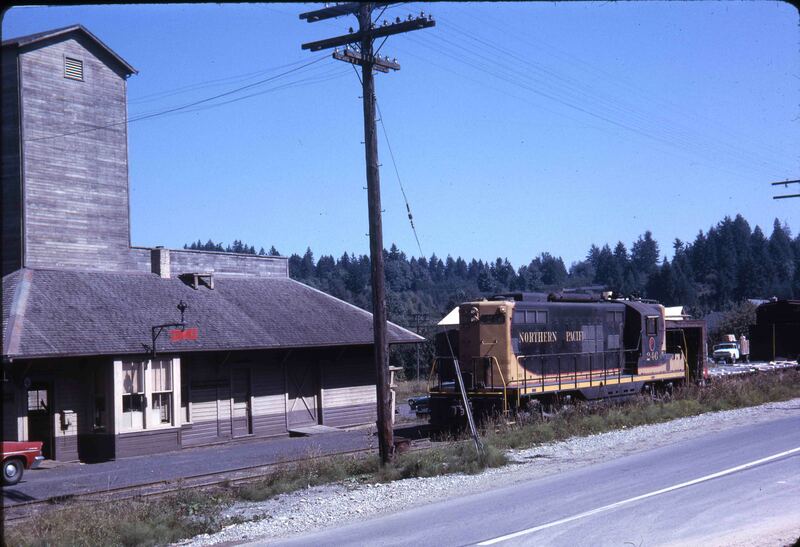 The Bothell depot was later repainted with just the sand color. In the early 1960s, the building was rebuilt removing the hip roof and composite shingle material. 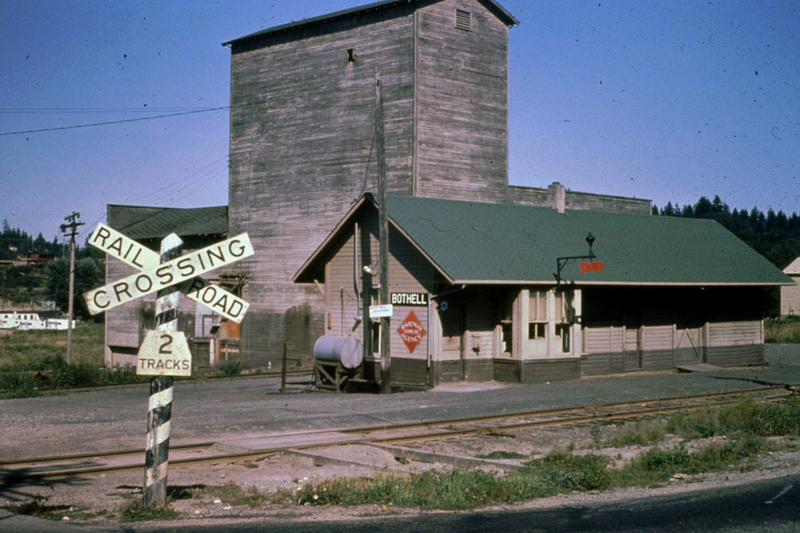 The picture yields information on a section car set out and the classic barber pole crossing sign. 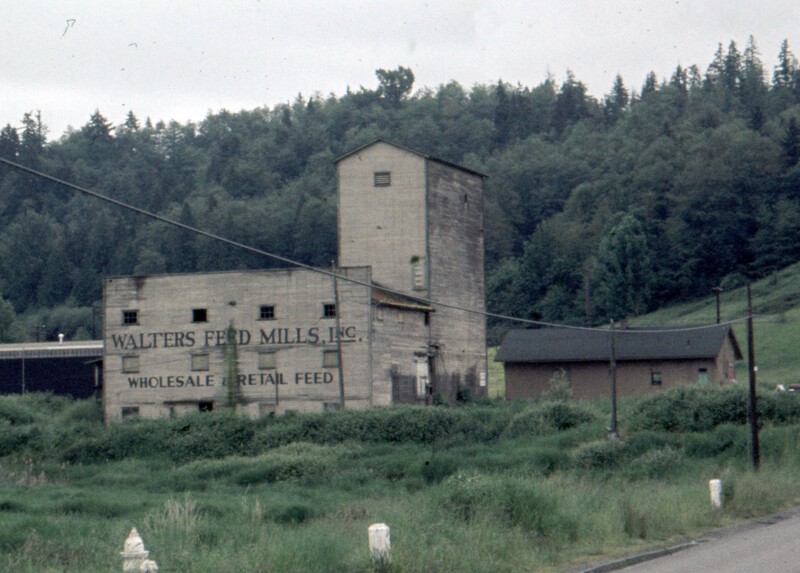 Here is a view of the opposite side of the Walters Feed Mill at Bothell. The picture dated from 1968. Earlier pictures show that there was a second smaller mill on the right side of the remaining building. I don’t know when this business folded. The whole region was rapidly changing from a rural farming area to residential. 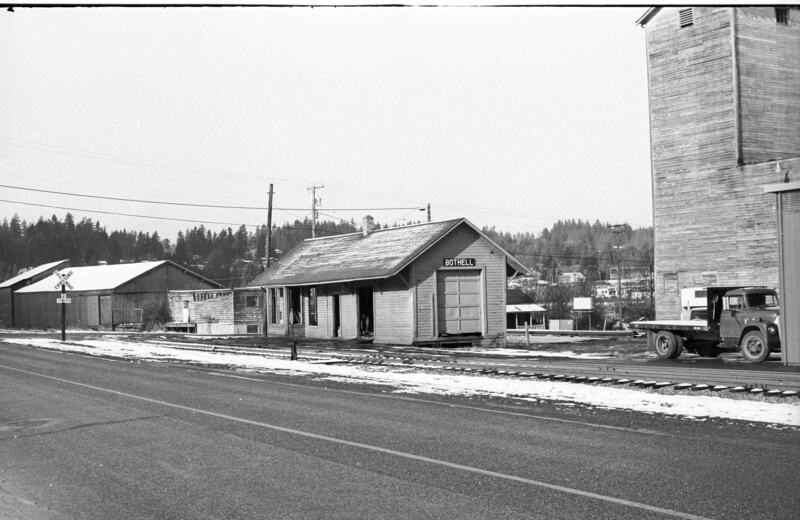 Rick Leach’s dad took many pictures in the area having lived in Bothell and Woodinville. Rick has shared some of these pictures of the 1940s. 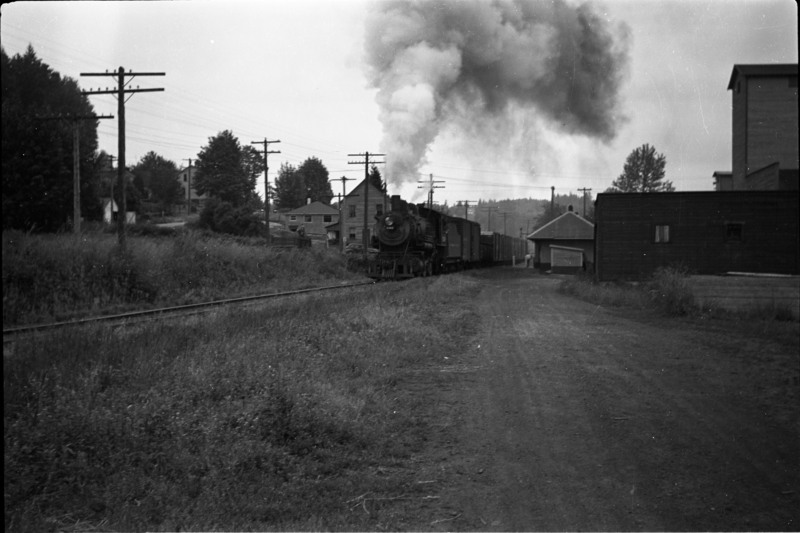 The first shot of Bothell was taken before 1945 showing ten-wheeler 1361 rolling into town. The depot was painted red and bottle green which was likely the original scheme applied by the NP when it took over the line. It is a bit hard to see the details of this picture but the locomotive headlight had a wartime hood in place. The depot did not have an coal shed on this end. Rick Leach told me that logs did fall off as the trains made their way past Bothell on their way to Kenmore. 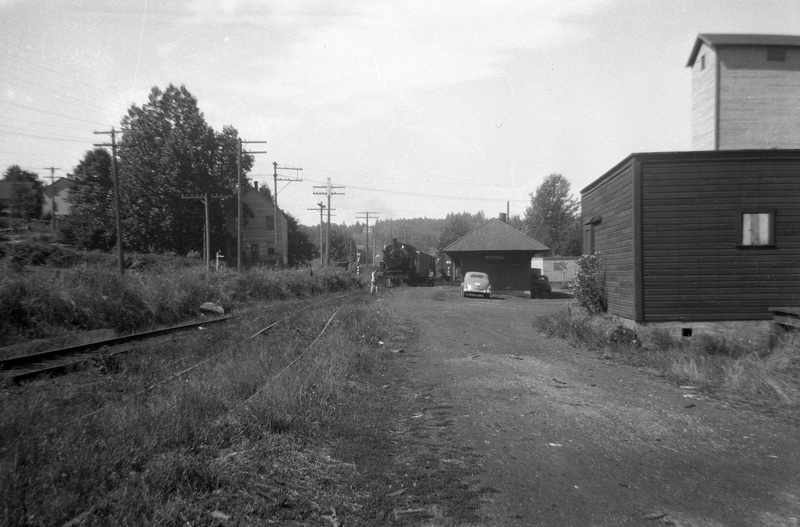 The Douglas Leach picture shown above was taken the late the 1940s after the depot was repainted and a small coal shed was added. The year is 1947 and there was a special train movement for some group excursion. 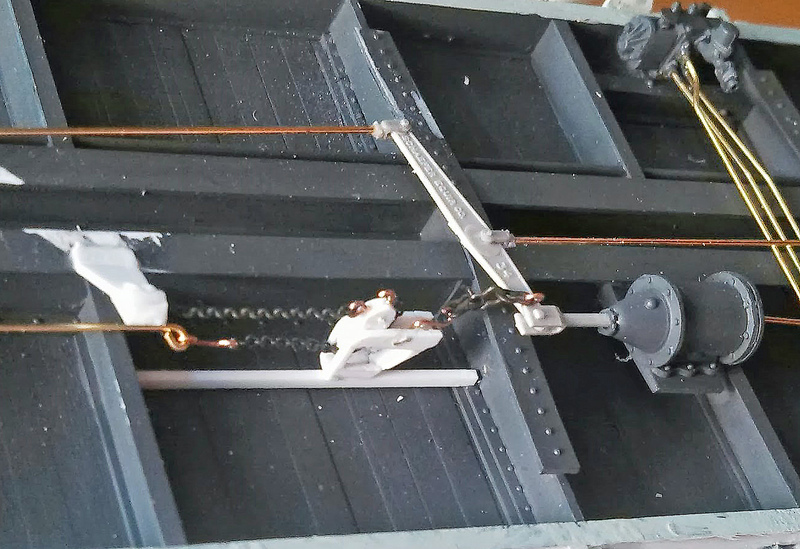 The old truss rod steel underframe coach was used as part of the movement. The picture shown more detail of the feed mill and the small mill structure to the left of the main building. Bothell has a simple charm that can be a manageable project. Thanks for the checking out this posting. Today, my wife and I traveled across the Central Valley of California to a small town called Winters. We had lunch at the Putah Creek Cafe. As always, the meal was very good in this local cafe. Afterwards, we walked around the town admiring the charm of a small farm community that is experiencing a renaissance of sorts. It seems that developers have discovered that Bay Area folks are willing to commute from Winters to their jobs. 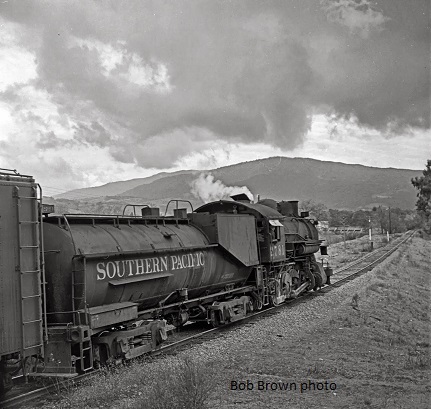 At one time, it was a railroad town being served by the Southern Pacific’s Capay Branch. The line ran from the Western Division mainline Elmira to the Capay which was a distance of 32.3 miles. 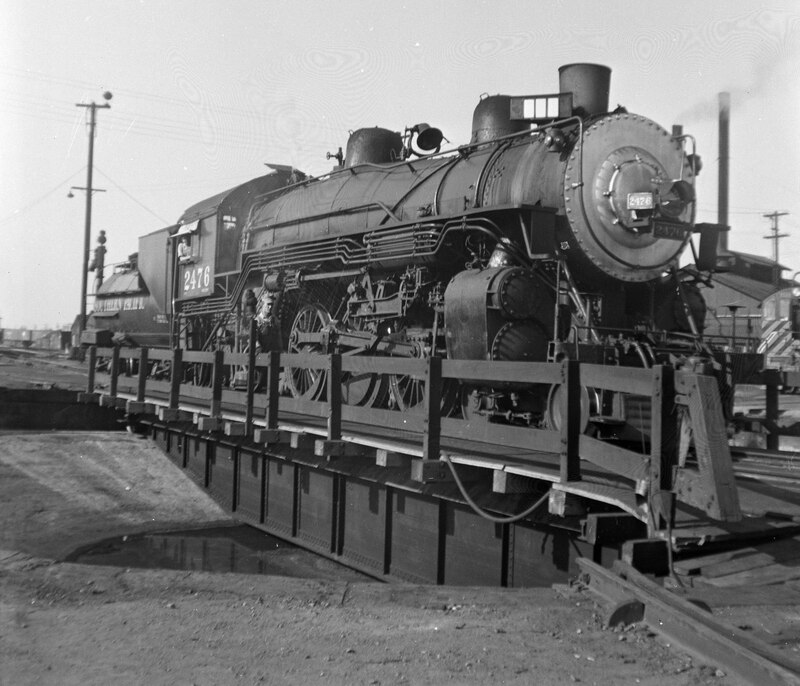 The branch was restricted to light axle loading due to several bridges. The branch served a large quarry north of Winters. The local agriculture business in Winters kept the road operating well into the diesel.era. During the steam era, the branch was served by M-4 class Moguls and the occasional Consolidation. In fact this branch and the Calistoga Branch kept the last M-4s running on the Western Division until 1953. 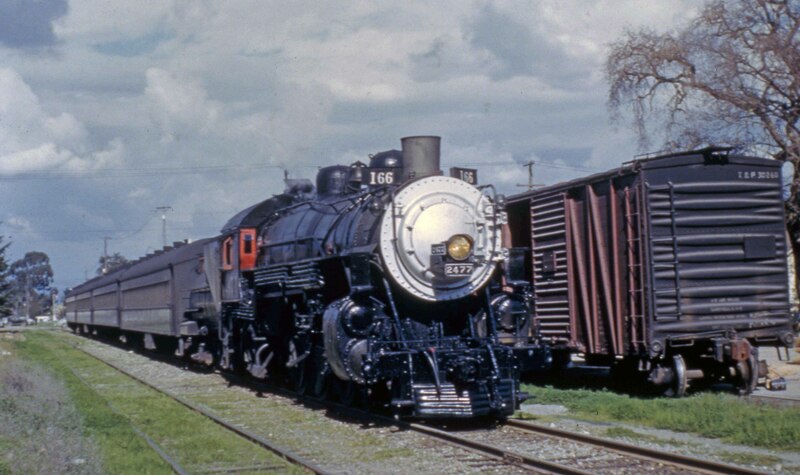 M-4 1639 was one of the last on the Southern Pacific. It saw regular use on the branch. The drawing shown above and below are from the Wx4 Dome of Foam collection. An unusual name for a site but it is a real treasure trove of western railroad stuff. 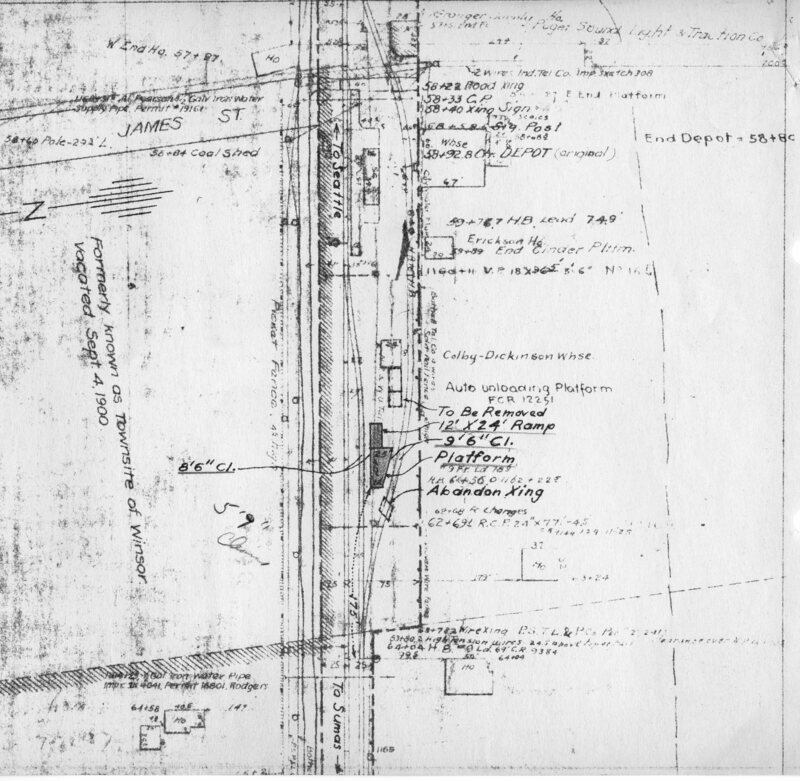 The track diagrams show the type of rail customers found at Winters. Packing sheds, box suppliers and dried fruit companies were significant to the branches revenue. Winters was the last Train Order Station operating on the branch. There was also a water tank and manual turntable located there. I am not sure how engines turned running north to Esparto and Capay. The Winters depot is gone but the one in Esparto is still there. The track disappeared in 1960. Railroad Street runs in front of the Putah Creek Cafe but with the exception of the bridge across Putah Creek all evidence of the branch is gone. I enjoy exploring little towns in the Central Valley of California. There are always old buildings that you can find in many of these towns. Hope you enjoyed my little excursion to Winters. 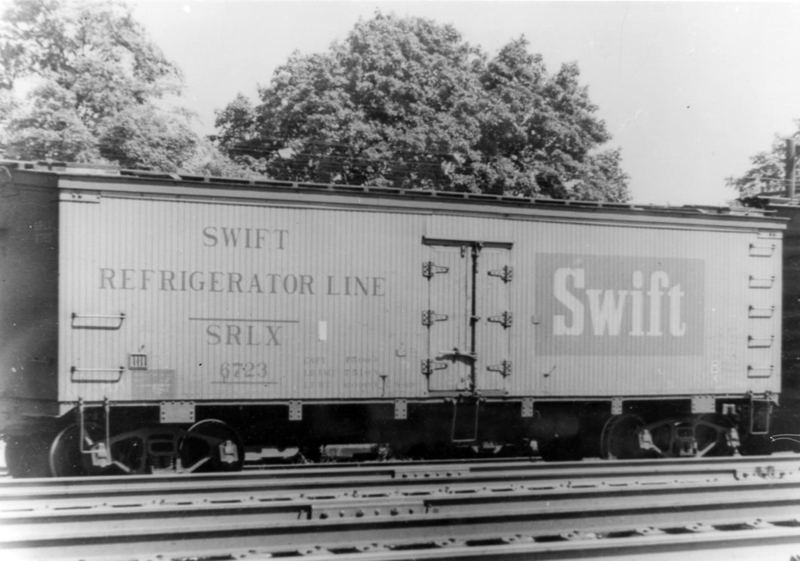 The Swift Company operated a large fleet of reefers to distribute meats from their slaughter houses to regional meat preparation distribution centers. 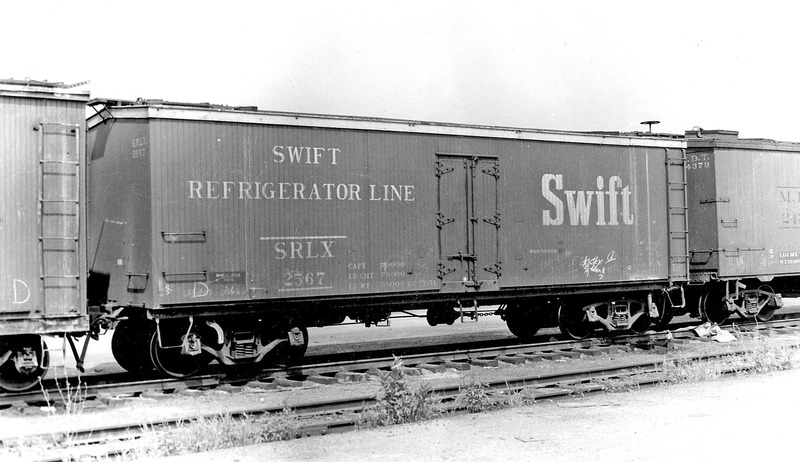 In 1948, Swift had over 3700 cars in operation. The cars were largely wood but steel construction appeared in the fleet after 1954. With the exception of one group, all of the wood cars were either 36′ or 37′ long. This length was typical of the wood era. The wood cars do vary in details and dimensions from one series to another. The picture at the top of the pages illustrates variation in underframe and safety equipment. 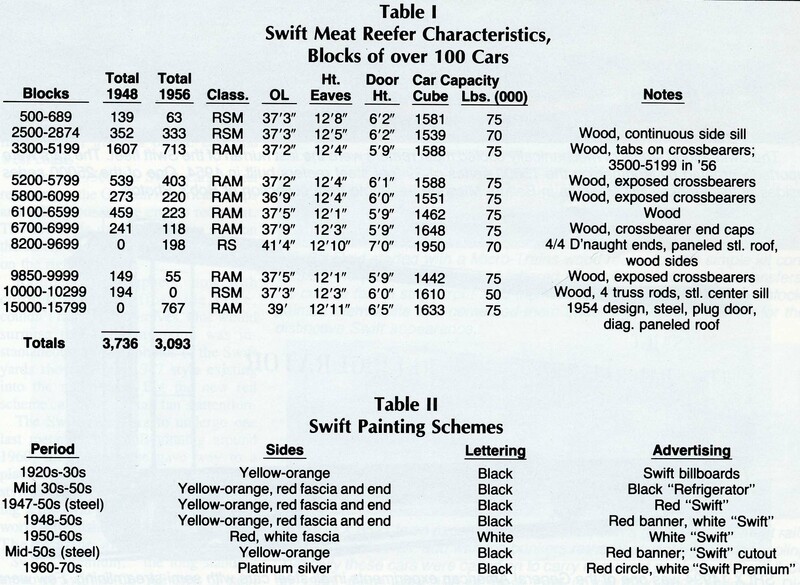 I have included a table that was once published in Railmodel Journal many years ago. It shows how the fleet was not a monolithic design that you see on most model railroads. With the exception of the Sunshine HO kit, nearly all commercial models missed the mark on this legendary car. As you may know the cars wore several decoration schemes ranging from a yellow with black letters to bright red with billboard lettering. The two photos above show the yellow carbody schemes. Quarter-inch scale modelers are fortunate that Protocraft offers two lettering sets that cover both of the yellow styles and the red sides with white lettering. The one car that interested me is in the 2500-2875 series. It has an exposed side sill with tension rod bolts and plates below the sheathing. The brake booster was a piece of hardware to reduce the force needed to apply the brakes. It could be found on a number or freight cars. I did a MKT boxcar for Southern Car & Foundry which had this part included. 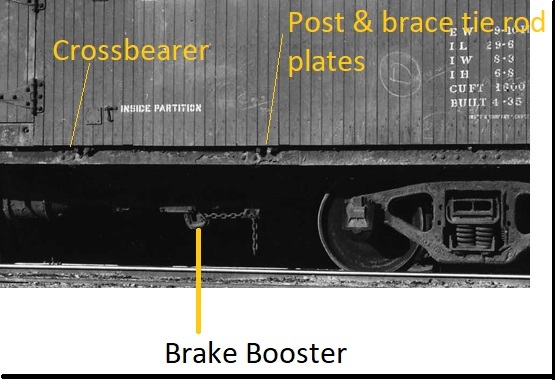 The picture shown below illustrates a typical installation on a freight car. Ted Culotta was kind enough to provide a correction for the proper name for this device. This brake booster is a Universal product. I am thinking that this car might be my next build once I finish the Rio Grande automobile car. 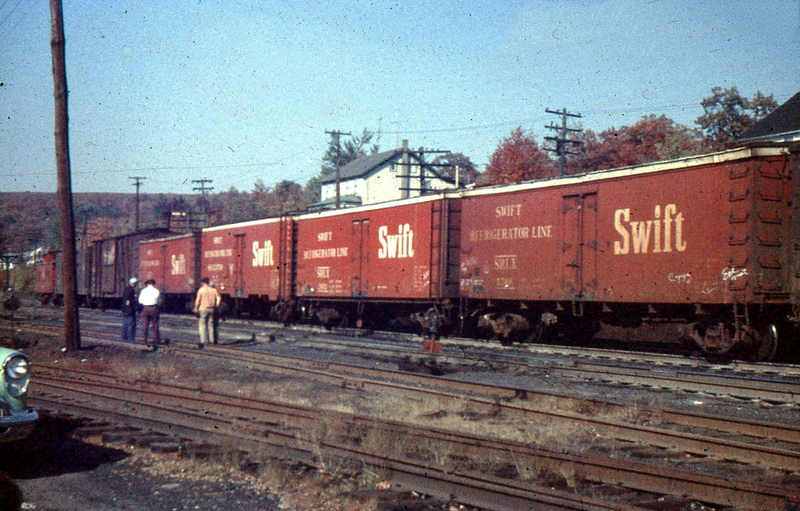 We all have favorite freight cars that we think about, collect information on and consider building some day. I have more than a few of these projects. It could be referred to as a “bucket list”. The one thing I have found is that the list changes from time to time. Years ago my bucket list had things like milk cars and coal hoppers on it. A little bit later my list changed to see the milk cars go away and Midwestern equipment and old wooden passenger cars pressed into mixed train service. I am always amazed on how modelers can follow a single prototype in the same scale for many years. It is not something I have been blessed with. In recent years, I have become very interested in wine tank cars. The first cars I remember seeing was in the middle 1960s in the Central Valley of California. 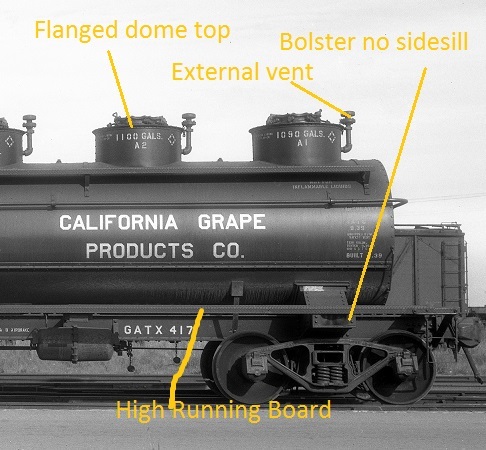 Wine as a commodity was rail-hauled since the early 1900s. It seems to have ended in the middle 1960s. Wine comes in a sorts of types and quality. Much of what was hauled by rail, was a lower grade product that was bottled in the market area served. Wine cars came in different configurations ranging from single compartment, two, three, four and six compartment designs. My favorite cars are the six compartment (domes) types. 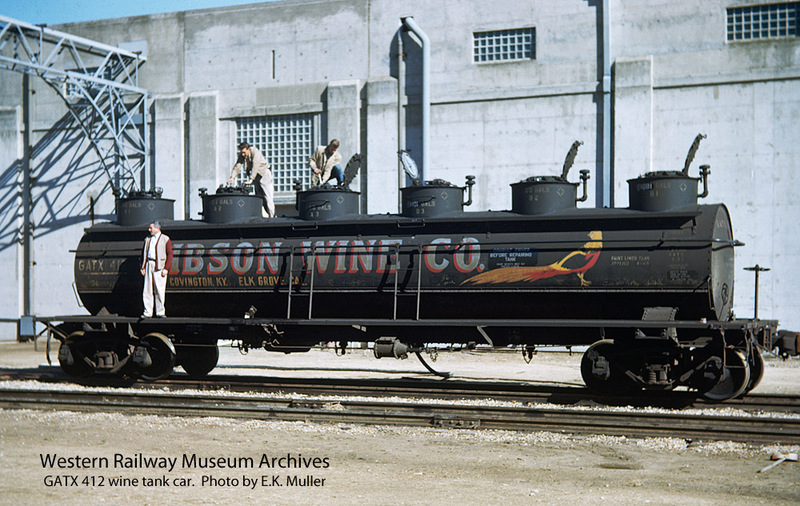 These cars were built by General American Tank Car and American Car & Foundry. There are significant differences between the AC&F and GATC designs. AC&F frames have channel side sills and lower running boards. Their design featured insulated domes with vents on the top. AC&F physical dimensions of the underframes: 9′-3″ wide by 40′-11 1/8″ over end sills, 30′-5″ truck centers. Tank dimensions: 66″ inside diameter by 34′-10 1/2″ long, wrapped with 2″ fiberglass insulation and 1/8″ jacket. Dome size: 47 3/8″ diameter by 10″ high. Ed Hawkins provided this information. 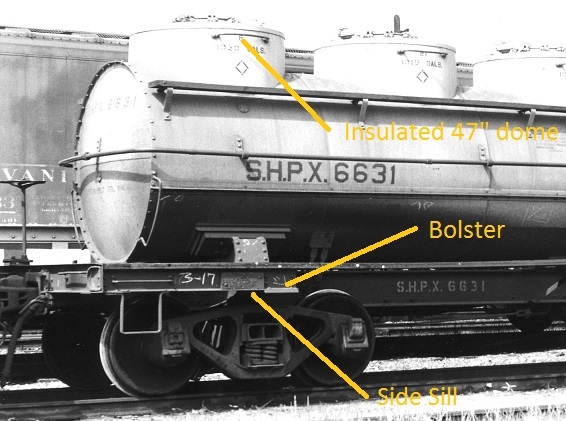 The General American Tank Car design shows major differences in the dome design. The external vent can appear on the dome top or side. back which sent this car to the Illinois Railroad Museum in Union, IL. What is lacking in my information collection is details on the GATC 6-compartment cars. I have been looking for things like tank diameter, dome height and dome diameter. I didn’t get to the car in Sacramento while it was in the museum collection. 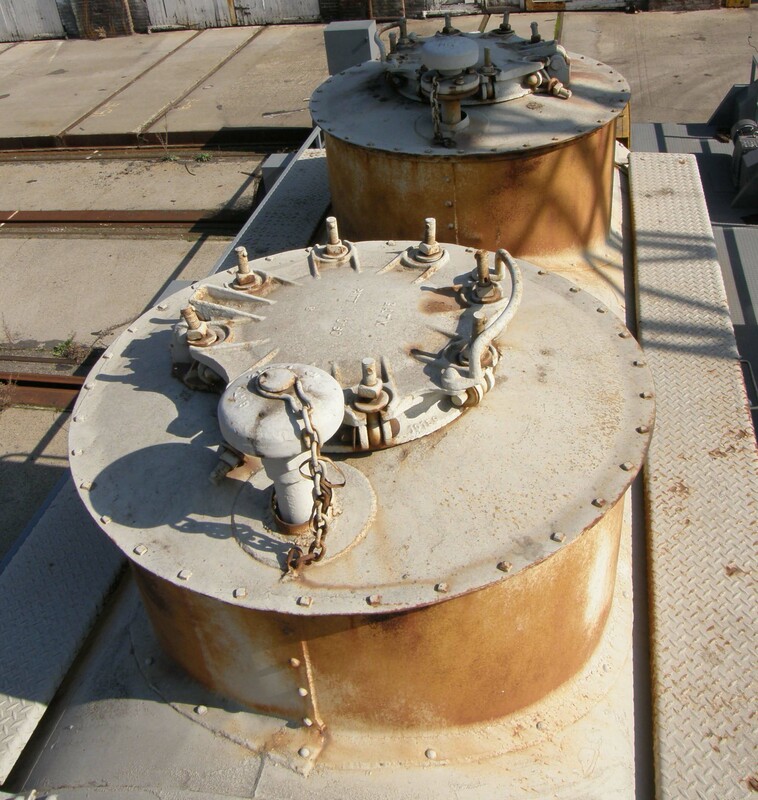 GATC underframe drawings are readily available but the tank is another matter. I have been told that the tank dimensions do vary between orders. Construction will have to wait until I get more information on the GATC tanks but I will start working on the AC&F car. 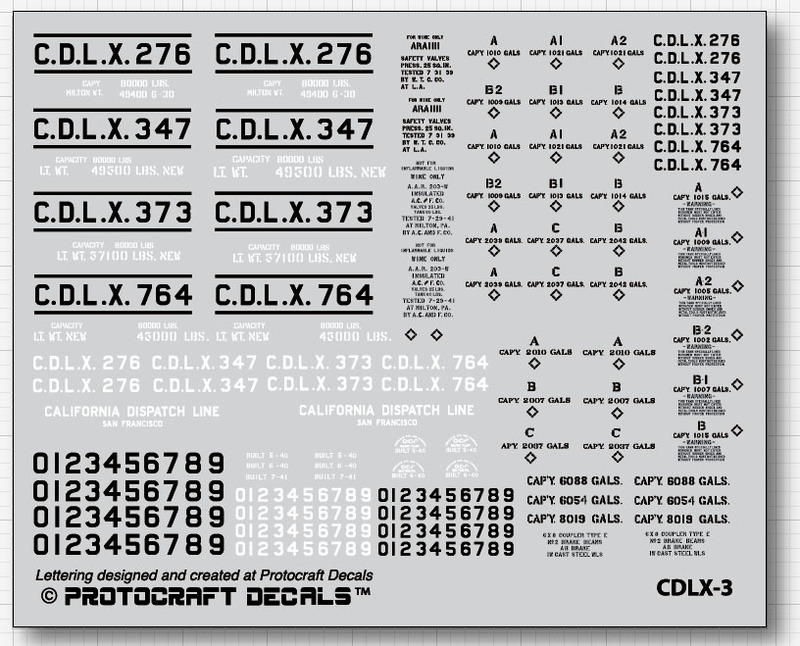 This would give me an opportunity to use the Protocraft California Dispatch Lines decals. 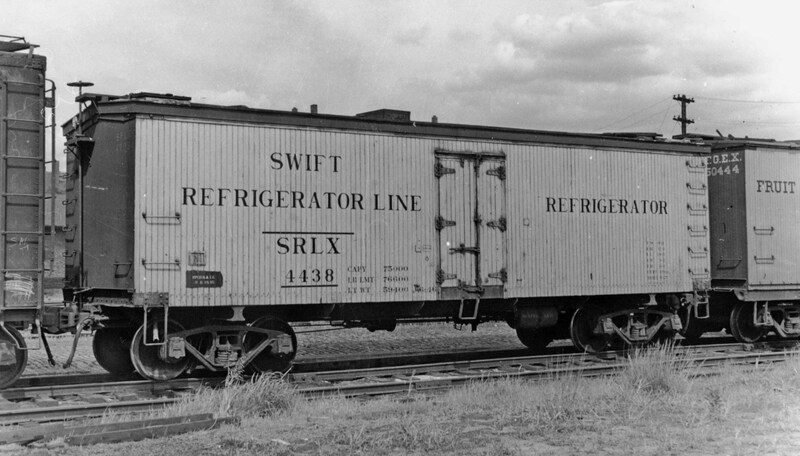 CDLX provided wine cars to shippers on short-term and long-term leases. Time to drag out the styrene and start hacking away. 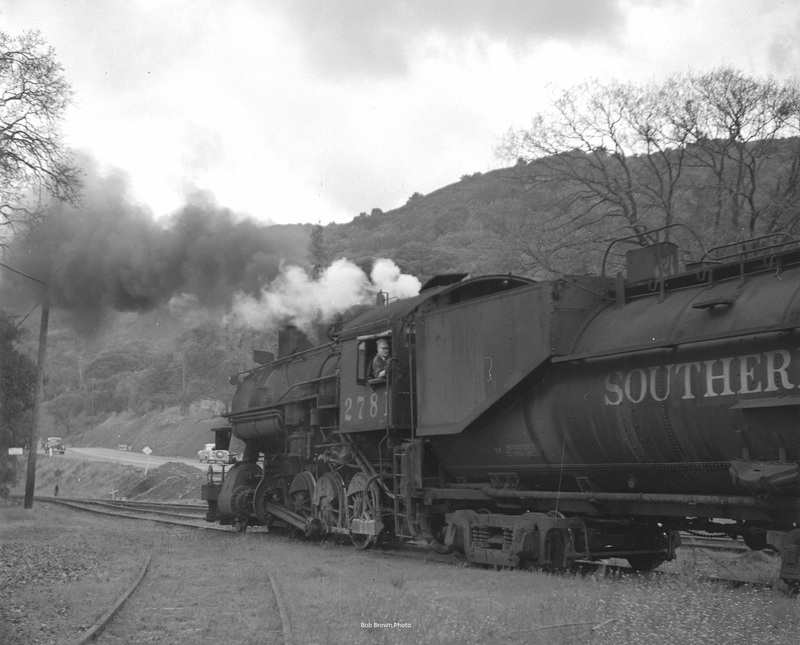 The Southern Pacific once operated a network of branches that served smaller communities in California. I moved to a new home in 1984 unaware of the fact it was built on the former Southern Pacific Vasona Branch. It took me a few years to realize that this was once the path of SP trains and in an earlier time the South Pacific Coast narrow gauge. The rail line once traversed the Santa Cruz Mountains on its way to the coastal city of Santa Cruz, California. 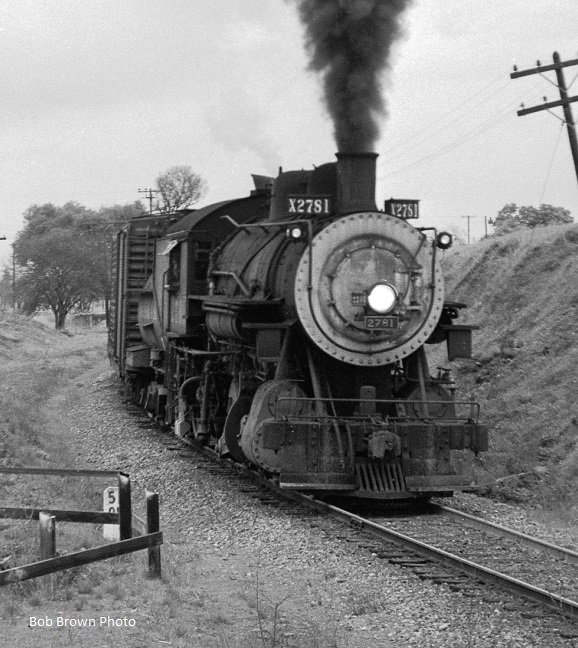 A historic three-foot railroad which became part of the vast Southern Pacific network. The line originated in the Oakland area and ran southwest to the Pacific Ocean. Los Gatos was the last town before the line entered the Santa Cruz mountains. It so happened that the mountains hid the San Andreas earthquake fault. In 1906, the earth moved and so the railroad line. The quake did significant damage to the right of way. Slides, caved-in tunnels and other problem blocked service. The SP decided to convert the line to standard gauge while repairing the damage. In 1940, fierce storms caused significant damage to the portion of the line that ran through the Santa Cruz mountains. 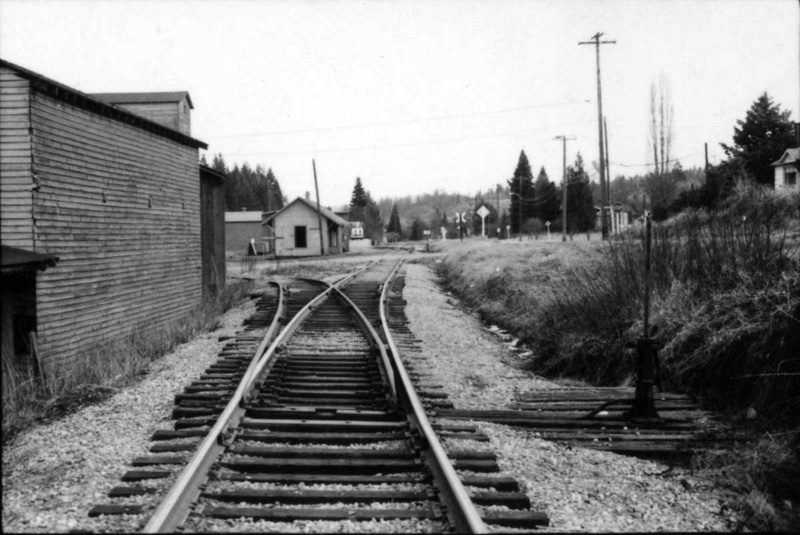 The railroad petitioned the California PUC to end service west of Los Gatos. By the way, Los Gatos is Spanish for “The Cats”. The Vasona Branch started in San Jose near the Race Street overcrossing. It ran to Campbell and then to Los Gatos. The distance of 8.3 miles took 35 minutes. Near Los Gatos, the line passed Vasona Junction. The junction was with the Los Altos branch that ran from Palo Alto south to the junction. 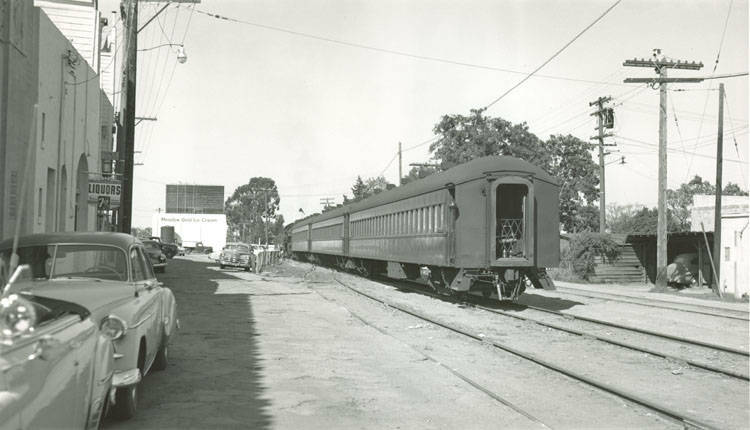 The SP provided commuter service from Los Gatos to San Francisco via Los Altos line. The trains were handled by steam up until 1955. 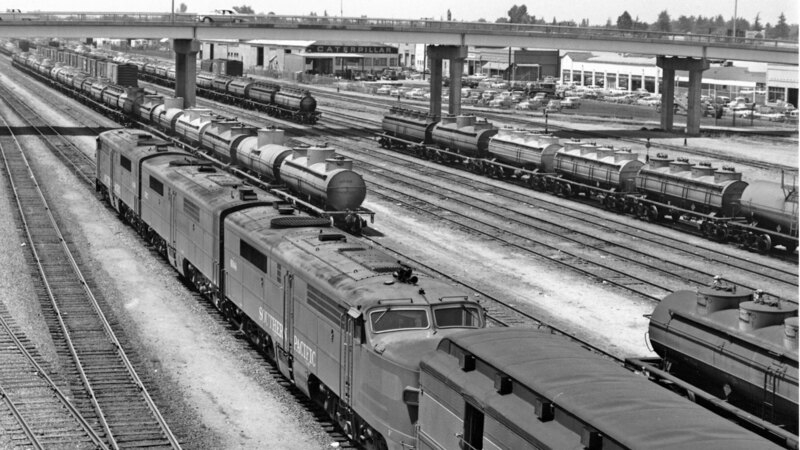 P-6 and P-7 locomotive classes were common on the line. Local freight ran on the Vasona and Los Altos branches. 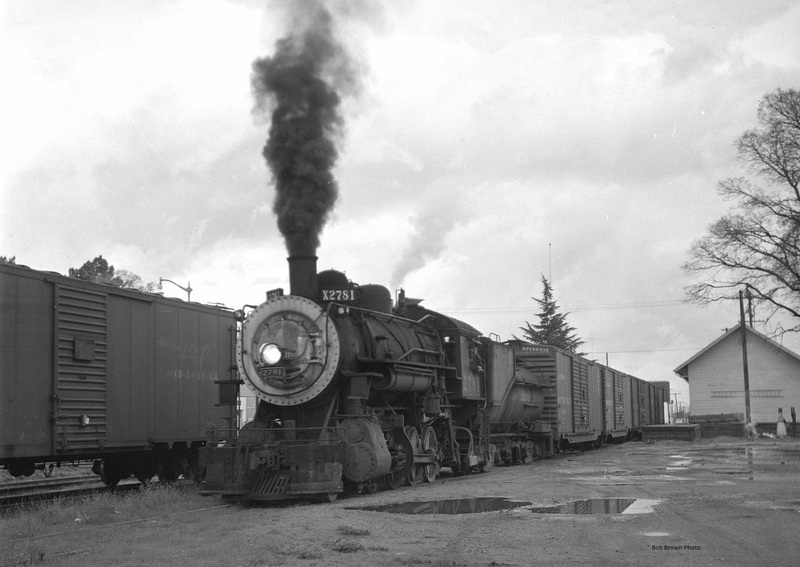 In the 1950s, consolidation 2781 was a common locomotive handling the freight runs. The picture above shows 2781 at Vasona Junction. The above picture shows the freight heading to Los Gatos. If you look closely you can see the dam for Vasona Lake. The mountain in the distance is Mt. Umunhum which was the fourth tallest peak in the Santa Cruz Mountains. Today, the dam and mountain are the only things you would recognize. For six years, my office was just to the right of the tender. The right of way became University Avenue and the office buildings were built on either side of the old line. The line between two main streets in town. The buildings on the left are the backside of stores on Santa Cruz Avenue. A lumber yard on the right side was served by the line. There were two lumber yards in town. An oil dealer and a couple canneries rounded out the local customers. Los Gatos had a freight house shown above and depot that was just beyond the freight house. The tall deodar cedar tree is still there but we would be look at the back side of the post office. The end of line is shown below. The locomotive would run around and tow the train to Vasona Junction to turn the locomotive. I wish that I had been there years before to see the line in operation. The branch was cut back to the Junction in 1959. 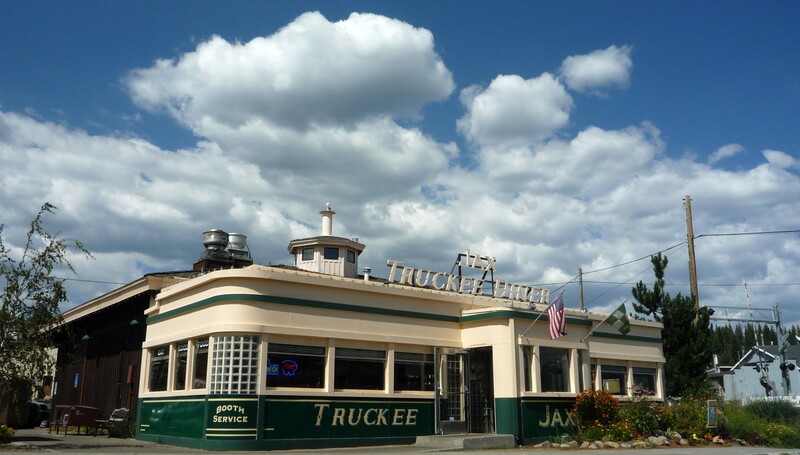 While in the Lake Tahoe area, I visited the now-famous JAX Diner in Truckee, California. Forget what you know of diner food. JAX is truly good comfort food using quality ingredients combined with skillful preparation. I sampled their breakfast offerings and found the pancakes and bacon to be wonderful. This is my second visit to the place. The diner was featured on the Food Network’s Diners, Drive-ins and Dives show. It has attracted a significant following and worthy of the praise heaped on it by the show’s host Guy Fieri. The diner is located right next to UP mainline over the Sierras. JAX is also referred to as JAX at the Tracks. During my visit several UP freight trains rolled with the their big yellow diesels reverberating off the walls of the diner. Following the lead of Trevor Marshall in his blog, I decided to post the diner experience. I always enjoy Trevor’s descriptions of visits to local pubs for a pint and possibly a little Haggis or something. While trains are the primary focus one has to have fuel while traveling. Now back to the museum. 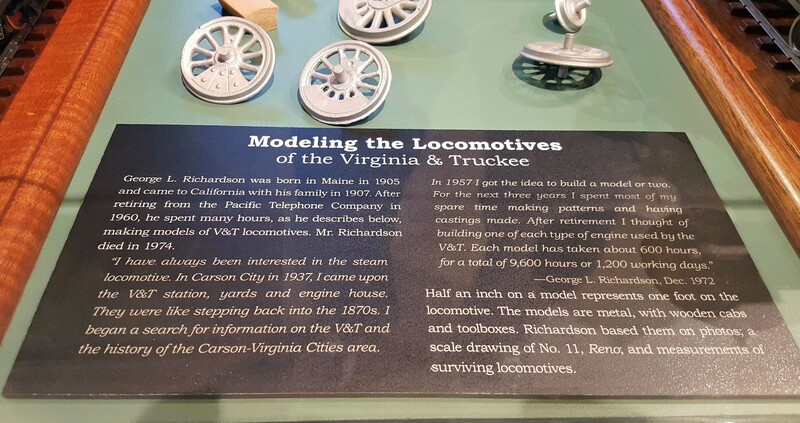 I had mentioned in the previous post about the museum’s collection of Virginia & Truckee models. They are all the work of the late George Richardson. The museum display contained a plaque giving a little history of the modeler and some sample driver castings. 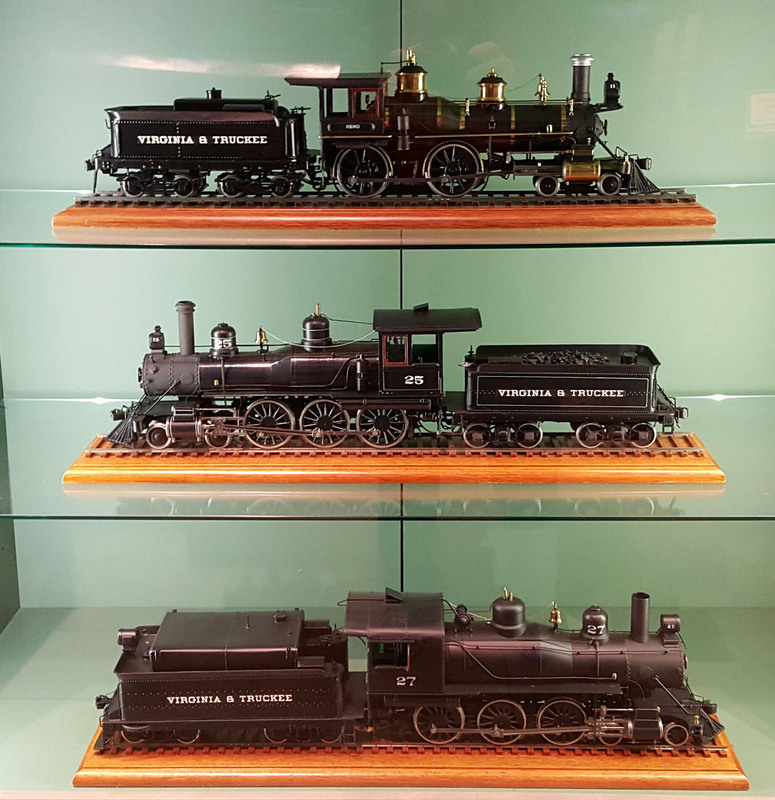 Mr. Richardson’s models are all displayed in glass cases to preserve and protect. It does make it challenging to photograph without reflections. At any rate, please look at the beauty of the his work. The above selection of pictures provide you an overview of George Richardson’s amazing work. 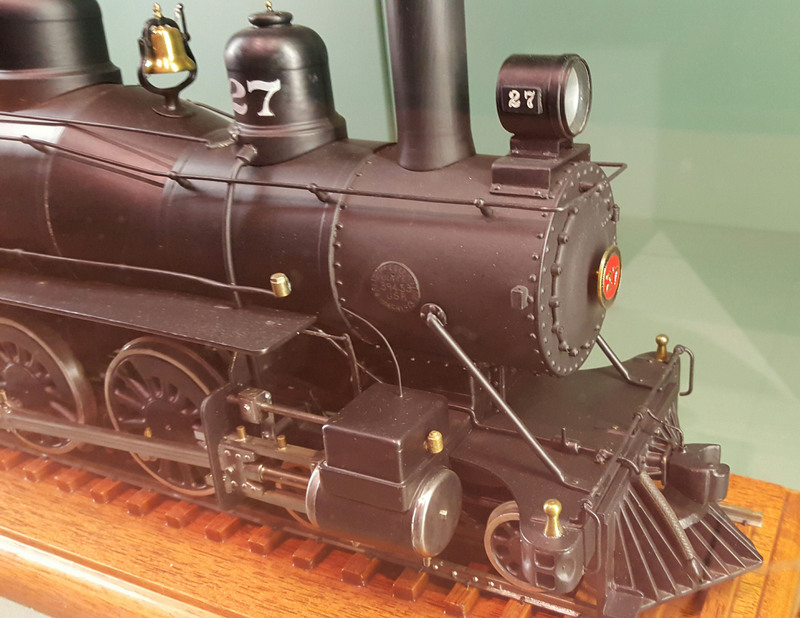 Please consider a visit to the Nevada State Railroad Museum in Carson City. It has a lot to offer. 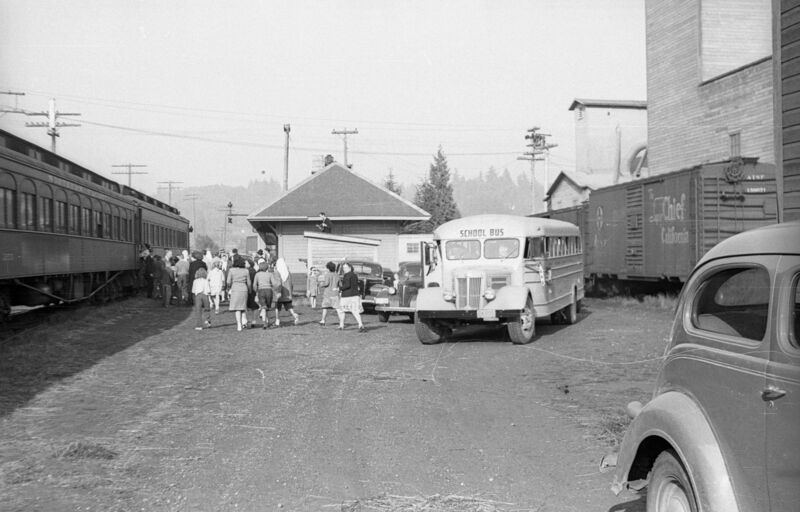 I came across this photo taken by the late Herb Chaudiere of an excursion that had stopped in Issaquah, Washington. The Northern Pacific line through Issaquah ran up the mountain to North Bend. The photo shows a rural scene with lots of trees and no homes or businesses. If you were in Issaquah today you would not find the track or water tank. You would find lots of homes and businesses like a major Costco office complex. In fact it is rather hard to imagine a railroad once ran here. If you travel east on I-90 you may catch a glimpse of some of the old trestles up on the side of the mountain. Modeling the railroad scene in the early or middle 1950s can be challenging given how much the urban scene has changed. We have to resort to books, videos and magazines like those published by historical societies. 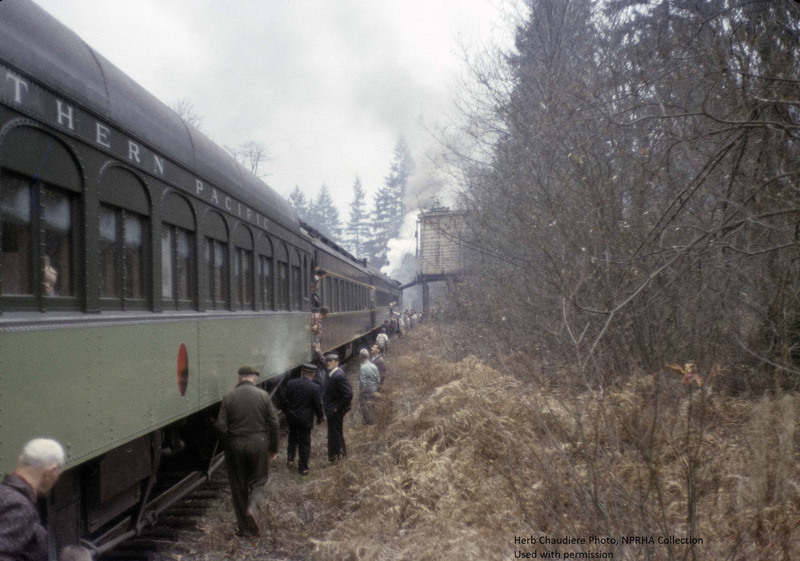 The Northern Pacific Railway Historical Association (NPRHA) has a very useful NPRHA website. They have an extensive collection of photos, drawings, rosters, equipment diagrams and long with numerous links to huge photo collections. It is a goldmine for those interested in the railroad or region. Check out the site soon.